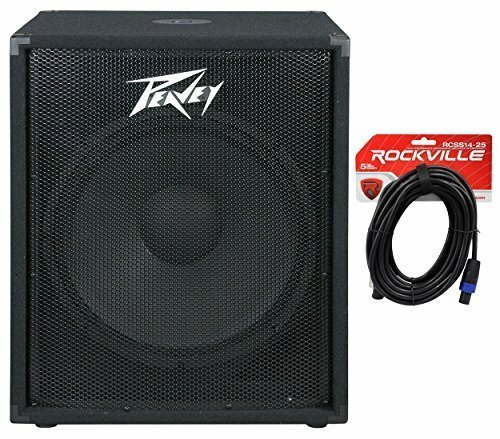 Peavey reinforces 'performance & value' legacy with the new PV® 118 subwoofer. Packed Dimensions(W x H x D): 21.37" x 23" x 28.75"
Vented bass subwoofer enclosure. Pro Eighteen(r) 18 inch premium woofer. Optimized internal low-pass crossover network. Pole mount adapter. Dado jointed 3/4 inch MDF construction. Two 1/4" phone jacks in parallel. Heavy-duty powder-coated metal grille. Peak Power Handling: 800 watts. Peak RMS Handling: 400 watts. Frequency Response: 40 Hz - 180 Hz (+/-3 dB). Impedance: 8 ohms. Sensitivity: 95 dB at 1W/1m. Packed Dimensions(W x H x D): 21.37" x 23" x 28.75". Packed Weight: 82.8 lbs..
Rockville RCSS14-25 14 AWG 2-Conductor SpeakON to SpeakON Pro Speaker Cable. 100% Copper Conductors for Lower Resistance. Black PVC Jacket for Both Durability and Flexibility. Intended for High-Current Applications Only, Not Line-Level Signals. Length: 25 Ft. Gauge: 14.